Elizabeth “Betty” McLoughlin Svirsky left this earth behind on January 19, 2019. She was at home, surrounded by family, before being welcomed into God’s Kingdom by her sisters Mary, Josie and Joan, her parents Katherine and Martin, and her grandson Matthew. Betty was born in Dorchester, Massachusetts, on December 30th, 1931. She was the fifth of 10 children – nine girls and one boy. From a young age, Betty was like a second mother to her younger siblings and contemplated whether she might someday enter the convent in service to God, but that ended at the age of 13 with a chance encounter at the Saturday matinee when she was introduced by a mutual friend to the love of her life and soulmate Bill Svirsky. Betty was an honor student and Vice President of her class at Monsignor Ryan Memorial High School. Upon her graduation in 1949, Bill presented Betty with a hope chest, and their fate was sealed. She worked at the Boston Public Library before they were married on June 13, 1953. Together they raised one son and seven daughters. Betty served this country as an Army wife, tirelessly packing up the belongings of her growing family year after year, as they were transferred from one military base to another, including one overseas assignment in Germany where she gave birth to two of their daughters. In 1966-67 while Bill served a 12-month tour of duty in Vietnam with the 1st Cavalry Division, Betty held down the homefront, a young mother on her own with 8 children aged 6 months to 11 years. Betty loved to go camping, and never complained at getting up in the middle of the night to pack up the car and camper for the chance to get away to the great outdoors. The family camped at every opportunity, especially enjoying an annual outing to Panama City Beach Florida. In 1964, while living at Fort Huachuca in Arizona, she convinced Bill to adopt a puppy, Heidi, who immediately became a treasured member of the family and joined them on every camping trip. Heidi was devoted to Betty until Heidi’s death in 1978. We have no doubt she is at Betty’s side once again. Upon their retirement from the Army in 1976, and with their own children getting older, Betty worked outside the home as administrative secretary for several industrial companies. In 1989 Bill retired from Digital Equipment Corporation in Palo Alto, California, and they were able to enjoy their love of traveling full-time. They became nomads in a series of recreational vehicles and enjoyed many trips traveling around the U.S., Canada and Mexico in their RV and visiting every state including Alaska and Hawaii multiple times. Often on these trips they were accompanied by one or more of Betty’s sisters and their spouses. While traveling the country, they took every chance to stop and visit with their children and grandchildren along the way. In addition to the U.S., Betty and Bill made many trips abroad, visiting the U.K., Europe, Russia, Australia and New Zealand over the years. They loved going to the Caribbean, and returned to St Thomas year after year. Betty and her sisters had a memorable trip to Ireland where they traveled in the footsteps of their parents, who were each born there before emigrating separately to the United States. They never forgot their Boston roots, though, and maintained a home for many years on Cape Cod. They returned once or twice a year and visited with family while there. In later years Betty and Bill settled in Arizona, where they enjoyed the warm weather and were happy to leave the Northeast winters behind. They settled into a home at Happy Trails Resort in Surprise, where they made many close friends and Betty enjoyed hosting “Cocktail Hour”. Throughout her entire life, Betty had an unwavering and devout faith in God that was beautiful to witness and an inspiration to others. She attended Catholic services regularly, most recently at Prince of Peace Church in Sun City West. Betty never stopped worrying about her children, no matter how old they were. She was a mentor, teacher, confidant and friend to all of them, rejoicing in their joys and triumphs, and consoling them in difficult times. Everyone who knew her benefited from that same compassion and empathy. Betty had a keen sense of humor that was never mean-spirited. She always looked for the best in others and forgave their transgressions easily. If a stranger was short or rude to her, she would tell her children “Maybe they’re just having a bad day”. Her generosity of spirit extended to creatures of all types. If you stopped by the Svirsky house over the years, you may have encountered (in addition to Heidi of course) a cat or two, gerbils, hamsters, Dutch rabbits, parakeets, fish, a turtle or lizard, two chickens, or an injured crow or other bird that was being rehabilitated. But by far the underlying constant in Betty’s life was the epic love story she shared with Bill. Theirs was a romance that proved that fairytales can come true. They remained as smitten, or more, as they were when they were dewey-eyed teenagers. Together they forged an unforgettable life built on love, family and faith. Their home, no matter where it was located, was always filled with laughter and optimism. In addition to Bill, Betty is survived by her son Bill and his wife Susan, and seven daughters, Kathie (Tom), Patricia (Jim), Christine (James), Maureen (Tom), Linda, Karen (Ken) and Helene (Matt), as well as 20 grandchildren and 3 great-grandchildren. 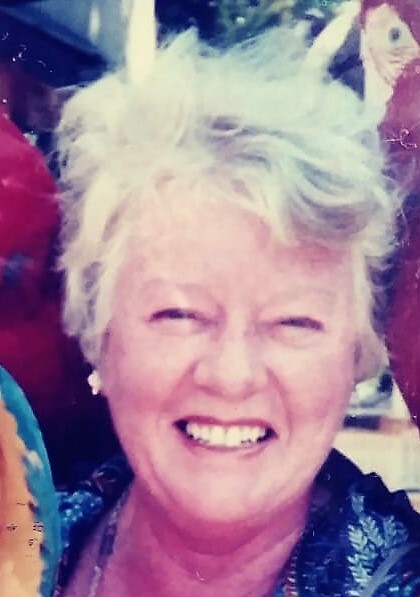 Those missing her will also include her brother Tom (Susan), her sisters Nancy, Kay, Pat, Helen and Lill, her brother-in-law Joe, her sister-in-law Susan, and many nieces and nephews. In lieu of flowers, a donation may be made in Betty’s memory to the National Military Families Association, www.militaryfamily.org.